Mini heaters can be very useful! 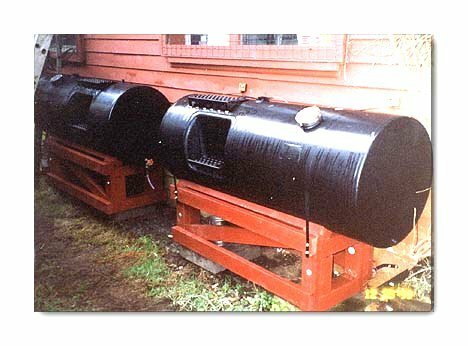 Before rural electrification began in the late 1930's, many homes and farms in the countryside used small kerosene heaters to warm milk houses, keep pump houses from freezing, and use in brooder houses to keep poultry from freezing - and just as important, to keep their water from freezing. 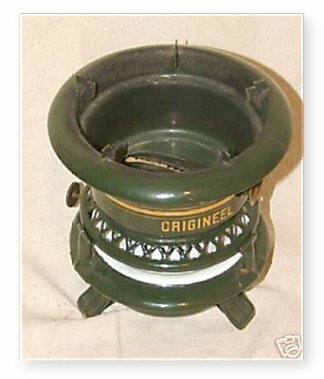 Many of those small kerosene heaters survived and can be found for sale on eBay at quite reasonable prices. On the left is an 19th Century P & A "brooder house heater" I purchased on eBay for $10.95. It looked very scruffy on arrival, so I cleaned it up, polished the brass wick assembly, and painted the base black. This heater uses a 1 1/2" flat wick to produce about 1,700 BTU/hr. 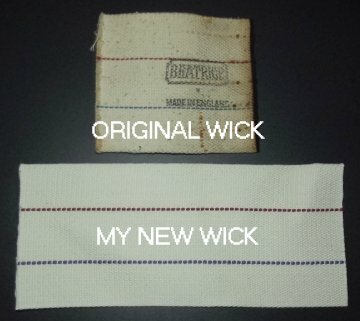 I have the proper wicks in stock, so wick replacement was easy. Note there is no chimney, and a kerosene lamp or heater will not burn properly without a chimney. A glass chimney is not proper: these heaters used a metal chimney, in this case one 3 5/8" wide - an odd size. 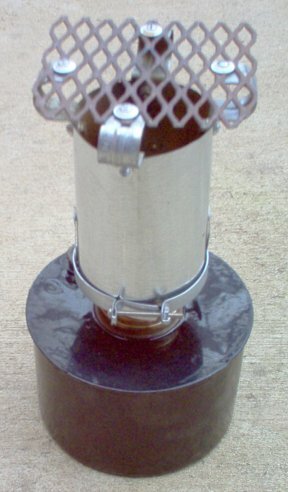 The entire top of the wick assembly is hinged to open for wick trimming and lighting, so a chimney fastened to the top is feasible. Now it is easy to make_a_chimney! ....I kept looking for a viable off-the-shelf chimney...and found one literally off-the-shelf. 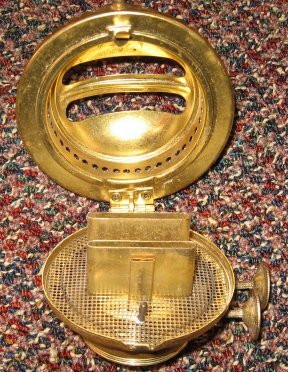 At right is a photo of a mini-heater before expanded metal was put on as a cooking grate, as illustrated below. Notice the beautiful chimney that fits perfectly? It is a family-size Campbell soup can. Now there is no excuse for anyone to have a brooder heater without a chimney! In fact, it is of thicker and stronger steel than the original chimney, and should last for decades. Click on photos to enlarge them. 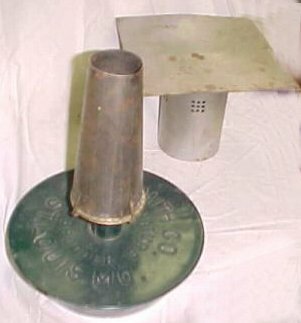 At right is a Miller brooder heater with a rare internal baffle to prevent fuel sloshing. The burner uses a 1 1/2" wide flat wick, so it produces sufficient heat to make a can of soup edible, etc. The pretty straight sided chimney was made by cutting the ends off a Boston Brown Bread can. 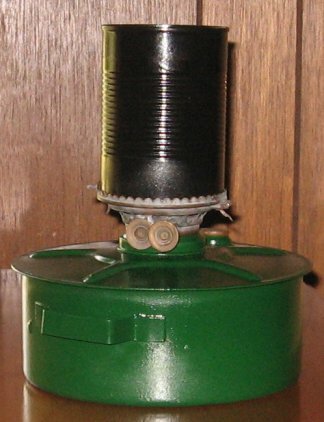 This particular brooder heater required the bottom (crimp on end) of the can to be bent in slightly to fit into the slot for crimping in place. The flat black paint on both the font and the chimney is 1200 degree F engine enamel. Later I will fit an expanded metal cooking plate on top using single-sided electrical conduit clamps as the support brackets. Bottom of duplex burner. Notice the small air vent above the top wick, designed to keep air pressure equal in the tank even with a solid fill plug. Keep it clear! Top of duplex burner. 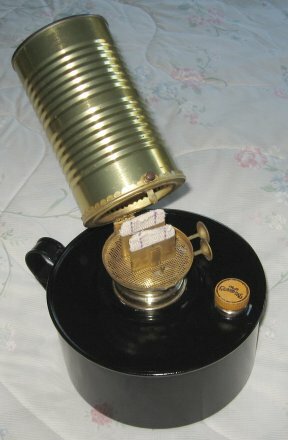 The tabs around the top edge must be bent up straight, the chimney inserted, then the tabs bent against the side of the can just enough for a firm hold. Hinged chimney open. The unusual double-wick gallery is shown. 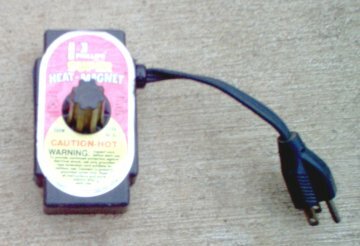 This mini-heater with two 1 1/2" wicks can produce serious heat for cooking! A perfect chimney is shown above. 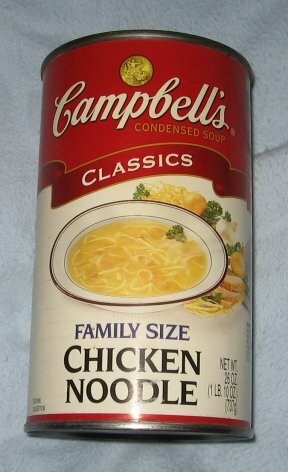 Boston Brown Bread may also be used, or any can of similar base such as family size Campbell Soup or pineapple cans (below). 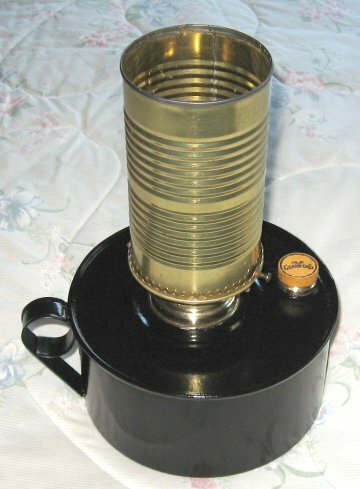 Three different styles of Miller Brooder Heaters using a 20 oz pineapple can as a chimney. 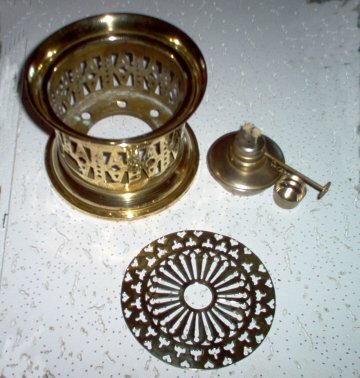 Left to right: small single wick, side handle; larger single wick with two "eyes" for hanging; duplex burner (two wicks) with a flat style handle on the side. The top and bottom of the pineapple cans were removed, the paper label and the label glue removed, then the cans were painted with 1200F black engine block spray paint. 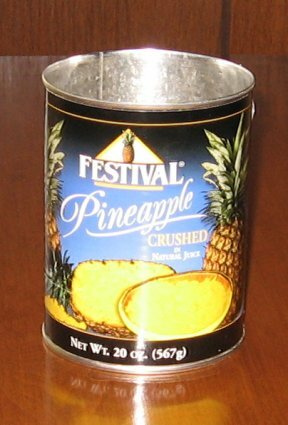 The 20 oz pineapple cans are not as tall as Boston Brown Bread cans, but with a rim diameter of 3.380" they fit well and burn just fine. This time I used green Rustoleum spray paint for the founts. An original, NOS Miller brooder heater tank. A little rusty on one side from a century of storage, so I scrubbed it with a nylon pad and washed it in acetone preparatory to painting. At right, the duplex burner ready for two 1 1/2" wide wicks. Click photos to enlarge them. The assembled parts needed for the chimney. I used 3/4" single-side conduit clamps and "Tee nut fasteners" (10 x 24) to hold the expanded metal above the chimney. The chimney is a Boston Brown Bread can, both ends cut out and painted with black 1200 degree engine paint. 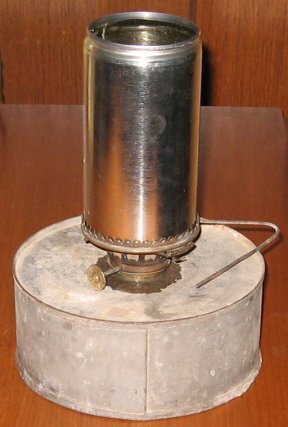 The finished mini-heater. Note the split key ring through the gallery to lift the chimney - it gets hot! The base was spray painted with forest green Rustoleum. The heat deflector was cut from a 4" aluminum dryer vent, and slides across the expanded metal. Now it is safe to use as a heater under a vehicle (with sufficient clearance, of course), in a greenhouse, etc. By removing the heat deflector the mini-heater is converted into a nice little stove for cooking, heating water for coffee or quick meals, whatever. 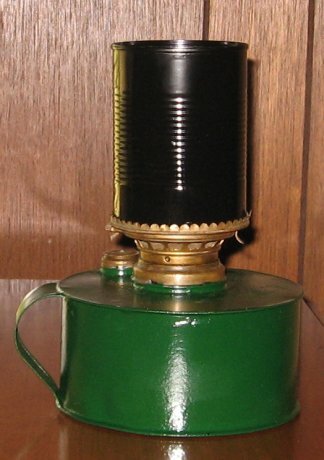 Miller also made a half-size brooder lamp. The one shown at left uses a 7/8" wide wick rather than the standard 1 1/2" wide wicks used in the brooder lamps above. I have cleaned this one. Now it is ready for final polish and paint. 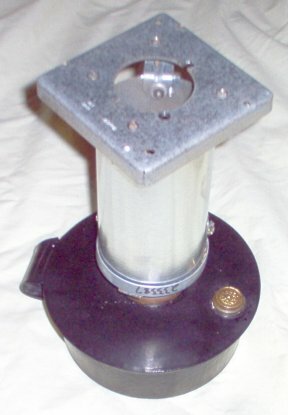 These smaller brooder lamps had a 2 5/8" crimped-heel section for a chimney. In this case, a metal can salvaged from a Slim-Fast drink fit perfectly! English Greenhouse heater from Norfolk Products, 55 Wilbury Way, Hitchin, Hertforshire, Sg4 Otw England. My heat deflector (above) is not as pretty, but mine works just as well. This English heater is rated at 2,100 BTU/hr from two 1" wide wicks. The duplex heater I made (above), using two 1 1/2" wide wicks, must therefore produce in the neighborhood of 3,000 BTU/hr. Not too shabby! 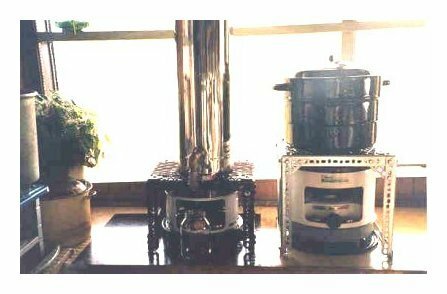 It cost me $55 to import the English Greenhouse heater several years ago, and only half that for my new Miller duplex mini-heater with all the parts and pieces added..
On the left is a turn of the century brooder chimney for a duplex wick heater. 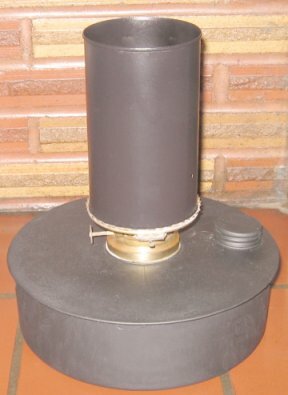 The center photo is of a 1940's era brooder chimney which does not have a tip over burner. My homemade chimney is on the right. All are metal to dissipate heat properly. The originals worked, but mine are strong enough to support a full tea kettle...and heat it to boiling! 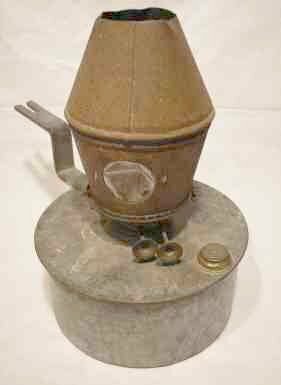 Miller made some very interesting burners which were designed to burn correctly without a chimney. Of course an open flame is a safety issue: these burners were intended for burning inside a metal housing. The burner could heat the metal which would then give off heat to keep chicks and chickens warm in the winter. Flocks hate to be disturbed when nestled for warmth, so the metal cabinet could have an outside hatch for inspection and refueling of the brooder heater. Notice the flame in the photo at right: steady, perfect flame and a nice, hot white. The draft design was perfect (see below right). Disassembled to show the parts. Note the felt wick! It is not woven cotton. IMPORTANT: For safe and satisfactory operation of your Zenith Chimneyless Kerosene Burner follow these directions carefully. 1. Allow ample time (at least 15 minutes) for flame t rise to its maximum height before turning to the height desired. This is necessary because as the lamp gets warmer from a cold start, the flame will creep higher. If this creepage is not allowed for and the flame is turned too high at the start, the flame will become much too high as the burner warms up. 2. Remember - a low or moderate flame will give more heat and will not smoke and have carbon deposits. 3. Keep wick in good condition - even and flat on top. Do not cut it unless badly burned down. Just rub off charred portion with a cloth or fingers then pat down until you get a good even surface on top. When through using burner for the season, remove the wick and let it dry out. Clean out the lamp and start anew when ready to operate again. The oil standing in the lamp for many months becomes rancid and wicks filled with this oil will not work properly. 4. 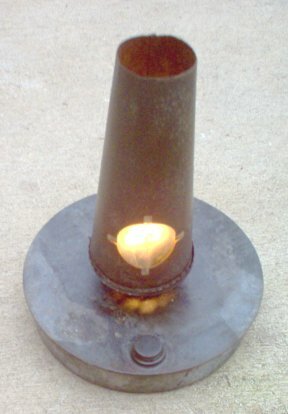 All burners are furnished with a small tube on the side to let gas forming in the lamp escape direct to the flame. keep this tube open and clean. 5. If burner smokes at any time, turn the flame down. If it continues to smoke, clean the burner. Important: When replacing hood on No. 2 and 3 Zenith burners the notch in the hood must be placed over the shaft. The Miller Company. Meriden, Conn. This is how I will use my Zenith Chimneyless Stove. At right shows kerosene stoves under cooking stands which I use for canning. I do not like to set a heavy pot directly on a stove. It is easy to bolt together a cook stand from 1 1/2" "L" slotted steel strapping. The Zenith Chimneyless burner is far from producing enough heat to boil a big pot of water, but will keep a pot of water hot enough for washing, etc. The Zenith stand will be 14" x 10" and 9" high so the brooder heater can slide under and be close enough to the pot (no chimney!) to produce good heat directly on the bottom of a pot or pan. It is not uncommon to find pinholes in the base of the fuel tank on century-old brooder heaters. Then they leak fuel. My latest find (above, with the soup can chimney) in early February, 2007, had a LOT of tiny pinhole leaks. I sanded the base smooth, picked at the holes with a stout sewing needle to clean debris from the holes, removed any oil from the metal with acetone, and applied a thin layer of J-B Weld epoxy over all areas that even appeared to have indentations or pits. After drying/curing, I sanded the J-B Weld smooth, put the tank on a piece of newspaper, and poured in some fuel. It worked! No leaks. J-B Weld epoxy can be easily applied with an artist's paint trowel, so little sanding is required. Of course all the sanding required to get to bare metal (so the epoxy will stick) removes the galvanizing, so the tank must be painted with an anti-rust type spray paint to prevent future rusting. The trick to success in sealing the leak is complete cleanliness before applying the J-B Weld. The tank must be emptied, wick assembly removed, sanded or whatever to clean the entire area where the leak is, then repeatedly brushed with acetone to remove residual kerosene. A thin layer of J-B Weld pressed into the seam or over the leak with an artist's trowel, then smoothing, will seal the seam. Let dry in that position for two (2) very long days. Then put enough fuel into the tank so it is 1" high on the bottom, set it on a section of newspaper, and watch for leaks. The newspaper will tell you if there are any leaks and where they are located. Then and only then can you again empty the tank, clean and sand, and paint with a zinc based paint like Rustoleum. Pictured above at left, my second model mini-heater. On this one I used a 5" square of expanded metal for a cover plate. 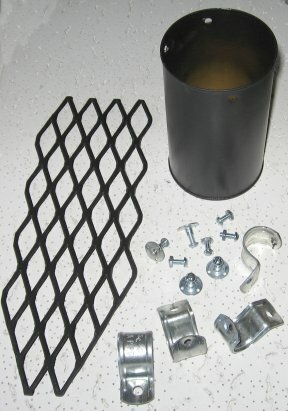 The center photo is of a cheap brooder house heater (not a P & A) which uses only a 7/8" wick. 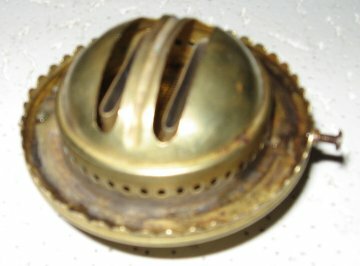 It has a mica window in the chimney for candling eggs, but the poor design of the burner allows it to smell when burning. The photo above right is a standard 110V heat magnet. At left is a small alcohol "crepe suzette" restaurant table cooking stove circa 1900. All filigree brass except for the burner, which is steel. Uses a 3/8" wick. 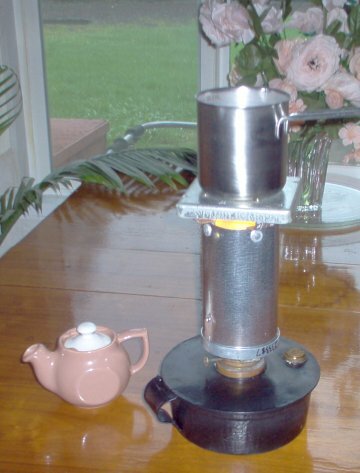 Photo near left shows the stove heating water in a heavy stainless steel 2 cup measuring cup. 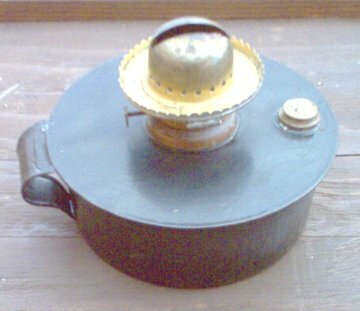 While American mini kerosene heaters were mostly of the farm or automotive style, there were several fascinating designs of small kerosene heater/stove combinations made in England and the Continent. 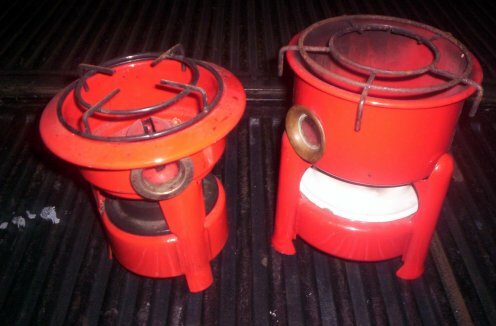 These stoves could be used in small "flats" in the city for cooking, or for use in trailers ("caravans") or cabins. 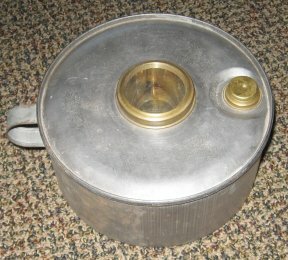 In fact, the last listed reference for the Harper Beatrice stove shown in the middle photo below referred to it as a "boiling stove," and it certainly well designed for that use: I can boil a tea kettle on it within 15 minutes, and it will easily boil vegetables, meat, rice, whatever is needed. This stove uses a 2 3/4" flat wick. 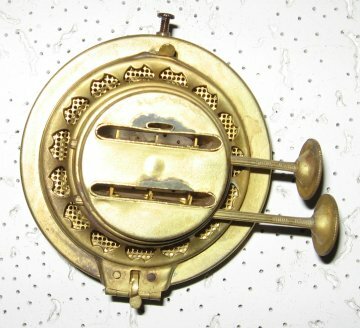 These Beatrice Boiling Stoves use a 4" flat wick available on my lamp wick page. 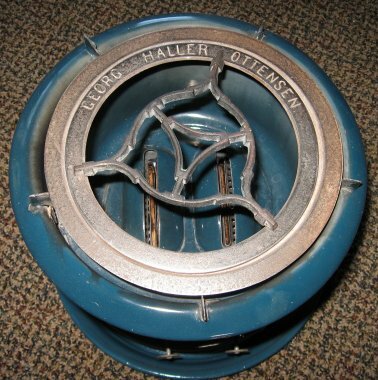 Above, left, is a Haller "Origineel" stove made by Georg Haller Co of Ottensen (Hamburg), Germany. 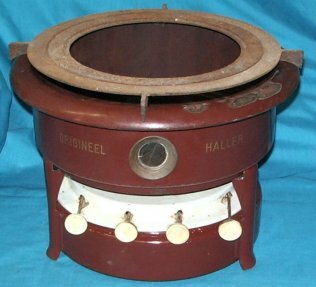 Haller stoves date from circa 1900, but some variations (clones) were made in the former East Germany and are marked DRG. It is of enameled steel construction. 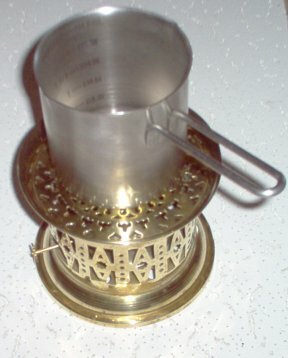 The white area visible at the bottom of the stove is the wick holder, and the venting visible allows a considerable amount of fresh oxygen to feed into the 2 9/16" flat wick. This stove burns very clean and odor-free. The fuel reservoir is primitive, however, being nothing more than a basin for the wick, and care must be taken to prevent spilling. I found this stove on eBay in as-new condition, right down to perfect gold leaf lettering. 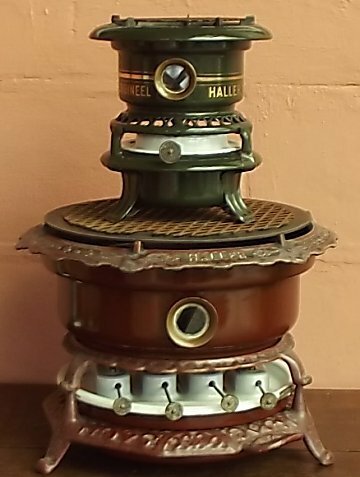 The middle photo shows a late model Harper Beatrice stove made by John Harper & Company Ltd., Staffordshire, England. The tank is relatively modern in design, well sealed, and does not spill fuel. The wide 4" flat wick and well-designed ventilation area allow sufficient oxygen for good, odor free combustion. I assume this stove was made in the middle 1900's based on the design, not on any readily available information, and as you can see, the stove was in as-new condition when I bought it, so it is very difficult to date the time of manufacture. The photo on the right shows a Beatrice Foundry #33 Boiling Stove (England) with an enameled, cast iron base, and marked "1901." A close examination reveals the flue section of both Beatrice stoves to be virtually identical (the #33 chimney has more depth), complete to the pot/pan rest on the top of the units and the wick assembly. These are well designed stoves and burn clean and odor free when burning Low Odor Mineral Spirits. 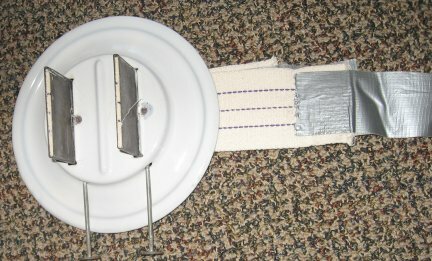 A thin wick extension is made from duct tape, then the duct tape fed down through the wick slots through the gearing. The wick is then pulled down. This method avoids any undue force on the gearing used to raise and lower the wick. I have information from John Harper, the last Director of the Company. The Beatrice #33 range was introduced around 1928, early versions had rounded ends to burner the gallery and during the 1930's had the casting date underneath. The '1901' stamped all around #33 stoves until they ceased production in the early 1970's refers to the 1901 pattern of 'bridle' used to secure the burner without screws to the tank. 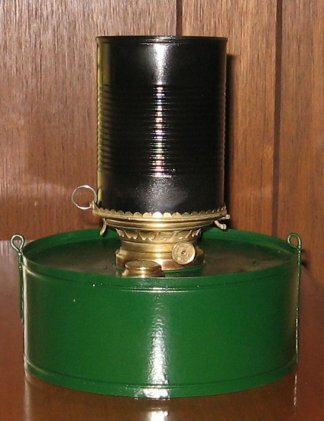 This was originally patented in the 1890's and first used on the Beatrice #1 stove. 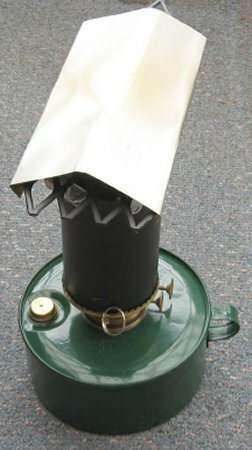 I hope to get a small book printed in the future detailing these sturdy workhorse stoves which are often overlooked for the more glamorous brass stoves. 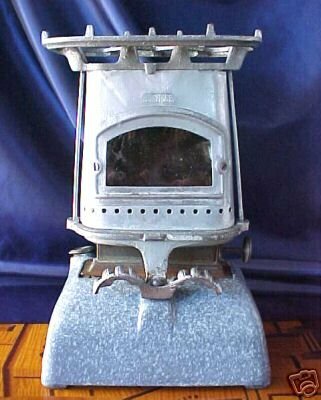 The #33 stove in your collection has the square ends to the burner gallery introduced in 1934 and the decorative handles dropped for the plain style in 1945 so should be from between these dates. Beneath the tank should be a small casting boss in the centre of the tank, with 'Made in England' in raised lettering. Post 1945 there was a large casting boss in the centre of the tank. 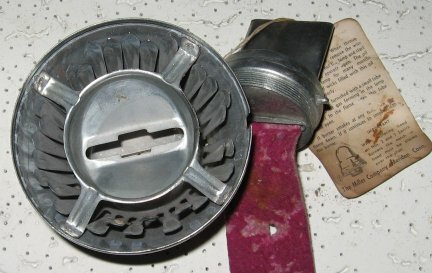 On the left is a photo of an original Beatrice 4" wick taken from the red Beatrice Boiling Stove above. At the bottom is my new Beatrice 4" wick - a clone of the original wick. CAUTION!!! 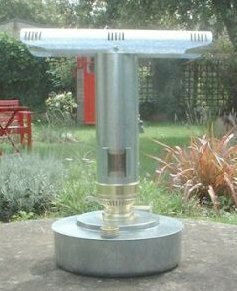 As with any kerosene appliance, these mini heaters need to be broken in by burning at maximum temperature OUTSIDE or in a shed, particularly if using galvanized metal for the chimney or top plate. You want to avoid breathing the toxic fumes from burned zinc (galvanizing). Once broken in, they can be used indoors, but their primary utility is for use as described above - in small utility buildings. 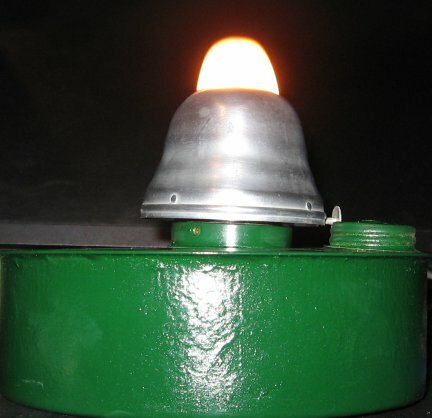 A clean burning kerosene lamp or mini heater depends upon the delivery of clean fuel to a good burner assembly designed to admit the right amount of air for complete combustion. Wide wicks, such as the 1 1/2" wick shown at left, only compound the problem. We cannot change the design of the burner unit, but we can make sure the proper amount of fuel is raised to the top of the wick via capillary action. Most fuel reservoirs are less high than the wick is long, so the wick tends to curl. Wide wicks have a tendency to float and curl, and when the fuel reservoir is less than half full, much of the wick can be above the fuel...lousy capillary action, poor combustion, and an aroma when burned. By sewing a small auto wheel weight to the bottom of the wick as shown at left, the wick is always immersed to the full depth of the fuel, providing full capillary action and a nice clean burn with no kerosene aroma at all. 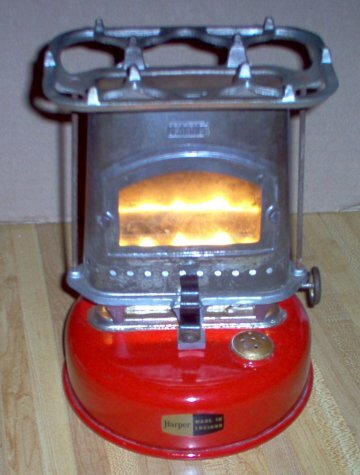 These mini kerosene heaters are very versatile! The ready availability a small heater which produces about 1700 BTU/hr for 48 hours on less than a quart of kerosene can be very useful in many situations, limited only by your own imagination. With a total height of 11 1/2", these mini heaters are short enough to fit under some vehicles to keep the engine blocks and radiators from freezing in very cold weather, but care must be taken to avoid placing them directly under rubber belts or oily parts which could become too hot for safety...and if it's windy, a tarp should cover the vehicle so the heat is not blown away. They can be placed in a well pump house to keep the pump and pipes from freezing. They can be used in a stored travel trailer or motor home to keep the water pipes from freezing, but care must be taken in their placement so the heat does not rise directly under a wooden cabinet, for example. They can be used to keep the chill out of small greenhouses to protect overwintered plants, or protect transplants against a late frost. These mini-heaters are very inexpensive insurance against sudden freezing weather conditions. Just make sure if you buy a brooder heater that it was made by P & A or MIller if you want the best model for clean burning. I've got some awful smelly burners that are still good for heating a well pump house, but too inefficient burning to use indoors. It's a dark and stormy night. The temperature is below 20 F, the wind is howling from the North, and the electric lines are covered with ice. Your well pump has an electric heat magnet attached. The storage building for your snow blower and/or ATV has an electric heat magnet attached to the engine block. If the electricity goes off in the middle of the night you would never know - and your well pump could freeze and crack and the snow blower or ATV would not start in the morning. But if you have a simple brooder house heater in the well house and/or storage shed, it doesn't matter if the electricity goes out - you will have saved an expensive pump from having to be replaced in miserable weather, to say nothing of the $400 or more expense of a new pump!